The Monkees Go Ape For Batman! �Dance, Monkee, Dance� - Peter answers the red phone, hidden under a transparent cake cover a la Commissioner Gordon. 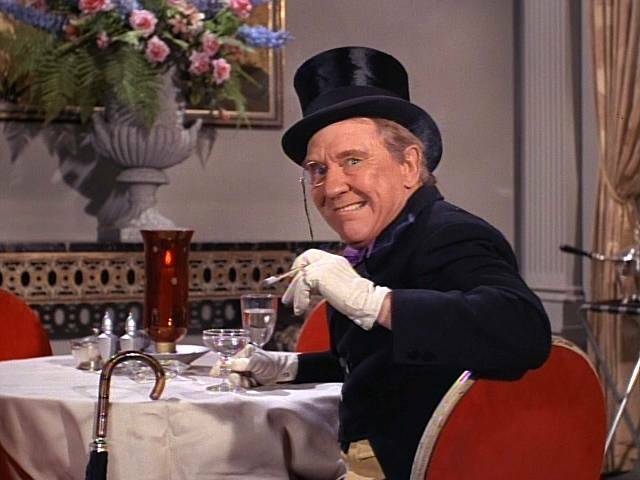 Also in this episode, Peter makes a reference to movie actor Van Johnson; Johnson, of course, was a Special Guest Villain on Batman ("The Minstrel") in its second season. And Miss Buntwell (Karen James) can be seen in a form-fitting gold outfit that was seen worn in 2 episodes of Batman: "The Penguin's A Jinx" (#8703-Pt. 2, Jan. 20, 1966) and "The Clock King's Crazy Crimes" (#9711-Pt. 1, Oct. 12, 1966). �The Case Of The Missing Monkee� - Micky Dolenz calls for a Bathook, which Michael Nesmith talks him out of since they're climbing the hospital's outside fire escape ladder anyway. Also in this episode, Peter Tork renders a cue from Act I of Ben Casey (ABC, 1961-66), one of whose episodes featured guest stars who foreshadowed both Batman and The Monkees TV series! In the December 27, 1965 "If You Play Your Cards Right, You Too Can Be a Loser" episode of Ben Casey, pre-Monkee David Jones appeared as a glue-sniffing wife-beater(?! ), and pre-Batgirl Yvonne Craig portrayed the hapless victim. �Captain Crocodile� - During the TV parody sequence, the group does an affectionate Batman parody, Frogman & Reuben (Holy amphibiousity, Frogman!). There is even a slanted camera angle, and the usual rash of action words abound: Rumble! Plink! Plank! Plunk! Miss! Foo! Bing! Bong! Bang! Splat! Kretch! Plop! Splinter! �The Monkees Get Out More Dirt� - The boys compete for the affections of the original Catwoman herself, Julie Newmar. �The Monkees In Manhattan� (a.k.a �The Monkees Manhattan Style�) - Michael Nesmith uses waiter Bronislaw Kolinovsky for one of the group's scams. The waiter is played by Olan Soule, who teamed with American Top 40 DJ Casey Kasem as the cartoon voices of Batman & Robin, respectively, for some eighteen years. 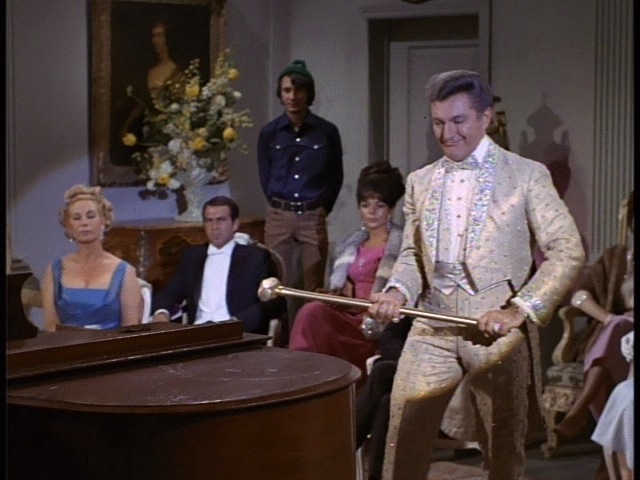 "Art For Monkee's Sake" - Legendary pianist Liberace, who was Special Guest Villain Chandell/Fingers/Harry in the high-rated Bat-2parter "The Devil's Fingers/The Dead Ringers" (prod. #9721, Oct. 26-7, 1966), makes a "smashing" cameo appearance here! "The Monkees On The Wheel" and "The Monkees Watch Their Feet" - Aside from the Frogman And Reuben sequence in �Captain Crocodile�, these episodes also borrowed the popular "crooked angle" camera shot element from Batman. �Fairytale� - In the fight scene where The Monkees take on Harold and Richard, Michael invariably shouts out fight words ("Bam! Boffo! And another hit in the armor!! "), replicating the fight scenes on Batman; another Batgimmick lampooned here is the 90 degree-shot of Peter walking up the castle wall, replicating the popular Batclimb. 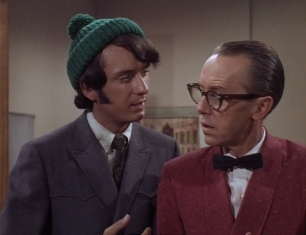 "The Monkees Blow Their Minds" - There is a cameo by The Penguin himself, played of course by Burgess Meredith, a sly tip of the wool hat to the pending end of the original ABC-TV run of Batman, which occurred in the exact same week as the airing of this episode. The following people who were seen in guest roles of assorted Monkees episodes were seen in several Bat-episodes as well: Donna Loren, Valerie Kairys, Ken Del Conte, Billy Curtis, Harvey Lembeck, Theo Marcuse, Doodles Weaver, Gene Dynarski, Burt Mustin, Allan Emerson, George Furth, Murray Roman, Louis Quinn, Milton Frome, Vito Scotti, Maurice Dallimore, Jesslyn Fax, Oscar Beregi, Reginald Gardiner, Owen McGiveney, Alfred Dennis, Monte Landis, Robert Cornthwaite, Norman Grabowski, Lisa Mitchell, James Griffith, Stacey Maxwell, Joy Harmon, and Walker Edmiston. The late noted TV writer Stanley Ralph Ross, who wrote several scripts for Batman, composed 2 second-season Monkees teleplays: Episode No. 40, "Monkees Marooned" (Oct. 30, 1967), and the teleplay and story (with Corey Upton) of No. 42, "The Wild Monkees" (prod. #4765, Nov. 13, 1967). Batman and The Monkees both shared the same sponsor: Kellogg's. In Batman: The Animated Series, Micky Dolenz gave voice to Mix and Max, twin mugs working for Two-Face (Richard Moll), in two episodes - 1992's "Two-Face" and 1994's "Second Chance." Batman and The Monkees both premiered exactly 9 months apart on their respective networks in 1966: Batman on ABC January 12, and The Monkees on NBC September 12. Batman was seen every week on ABC @ 7:30/6:30 Central, as was The Monkees on NBC. ABC, Batman's old network, aired repeats of original episodes of The Monkees on its Saturday Afternoon schedule between September 1972 and August 1973, and The Monkees' 60-minute reunion special Hey Hey It's The Monkees in February 1997. Frank ("The Riddler") Gorshin and David Jones both appeared as guests on the February 9, 1964 telecast of The Ed Sullivan Show (CBS, 1948-71)---the very landmark telecast which also saw the first American performance of the legendary Fab Four, The Beatles! Within 2 years, Gorshin and Jones would become household names as regulars on the Batman and The Monkees TV series, respectively. 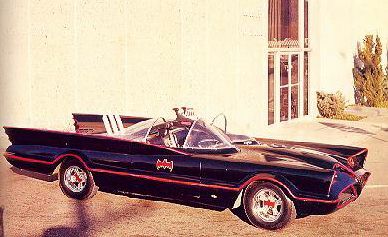 The war trench sequence from The Monkees' movie HEAD was filmed on Bronson Canyon in Hollywood Hills, the same shooting location of scene of The Batmobile leaving The Batcave on Batman. Terry (Teri) Garr, who portrays Testy True in HEAD, previously had a bit part in a February 2, 1966 episode of Batman (ABC, 1966-68): "Instant Freeze" (#8707-Pt. 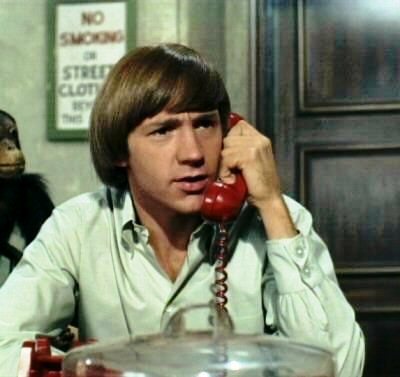 1), which also guest-starred pre-Monkee TV guest Ken Del Conte (Swine #1 in Episode No. 4 of The Monkees, �Your Friendly Neighborhood Kidnappers� [prod. #4703, Oct. 3, 1966]). 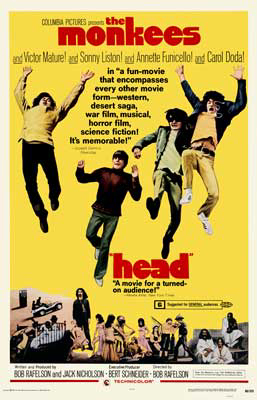 Chuck Gaspar, the special effects man for The Monkees' movie HEAD, was special effects supervisor for a later Bat-movie, 1992's Batman Returns. Special thanks to Michael Daly for citing several of these connections in The MF&TVV Message Board which helped inspire this page! Pictures used on this site courtesy of Melisssa's Monkees Episode Guide, Love Is Only Sleeping, The Monkees Home Page, The Futura/Batmobile Home Page, and Ty's Yvonne Craig Homepage. 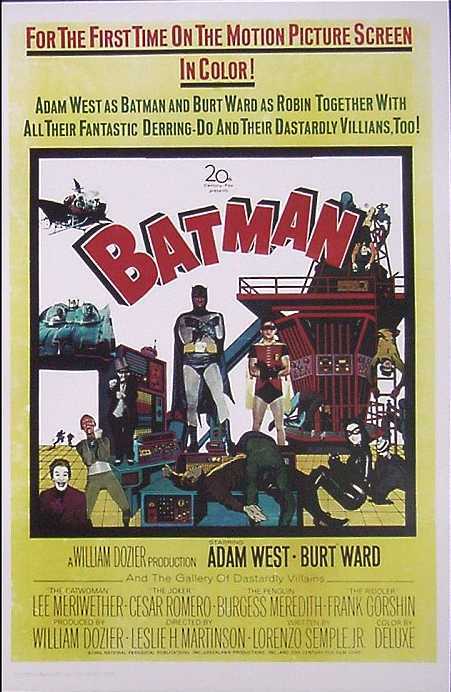 Batman TV Series Copyright &COPY; 1966-68 Greenway Productions, Inc. and Twentieth Century-Fox Television, Inc. All Rights Reserved.